Funny timing on this. We literally have a call open with MS right now because we have a database with a half-terabyte log file that won’t shrink, despite the DB being in simple mode. Appears to be IMOLTP related. I’m starting to feel about it like I feel about Service Broker (which we have in place in several places, as well as on every server by dint of using Event Notifications): when it works it’s amazing, and when it doesn’t you question your decision to ever start using it. In-Memory OLTP is certainly not for everyone but it can solve some very real problems and when it does it can be positively mind blowing. PAGELATCH_EX contention on the system base tables in tempdb was a very real problem for us until we started using memory optimized table types (and in some cases, actual memory optimized tables utilizing row level security and constraints to mimic the behavior of a temporary table). Log files that won’t shrink despite simple mode! That’s the stuff of nightmares. I did want this post to come out on Halloween (you might be able to tell by the spooky graveyard). But I postponed the post to include stuff I learned at Summit. PAGELATCH contention in tempdb is my nemesis. It is a real problem for us too. I really hope there’s a scenario that allows us to use memory-optimized tvps. The memory-optimized tvps don’t even use the memory-optimized filegroup do they? In my ideal world, Microsoft could split off Hekaton table types from the rest of Hekaton and I wouldn’t need that stupid filegroup in the first place. I previously had a similar issue as “half-terabyte log file that won’t shrink, despite the DB being in simple mode”. My fix was set mode to fully logged, shrink file then reset to simple. Not sure if this fix would work in your scenario. >> In my ideal world, Microsoft could split off Hekaton table types from the rest of Hekaton and I wouldn’t need that stupid filegroup in the first place. I second that. It would be good to use memory-optimized table variables without having to create an IMO Filegroup. No grow on space, no affecting checkpoints, no log truncation issues. Please request a DCR (Design Change Request). My conclusion is that In-Memory OLTP does not support migrations in most cases. It is maybe good for new projects where you expect many transactions, but migrating an existing database is not properly supported. •	Take a full backup. •	Rename your disk-based table. •	Issue a CREATE TABLE statement to create your new memory-optimized table. •	INSERT INTO your memory-optimized table with a sub-SELECT from the disk-based table. •	DROP your disk-based table. •	Take another full backup. Successfully migrating a table to In-Memory OLTP is a lot of work. Imagine that you have to use this recipe for converting hundreds of tables. That does not sound good! Furthermore there is an issue with CHECKDB(CHECKTABLE). If you decide to migrate a small number of tables, you will get another unpleasant surprise. It’s not possible to establish a relationship between an in-memory table and a disk-based table. Foreign keys between in-memory and disk-based tables are not supported. Basically, you will end up with a database without referential integrity. Furthermore, if you would like to use triggers to establish referential integrity, you get another surprise: there are no possibilities to access disk-based tables in natively compiled triggers, and only that kind of trigger (natively compiled) is allowed on In-Memory optimized tables. Although Microsoft has invested a lot of effort in In-Memory OLTP technology, currently the functionality is not satisfactory. We cannot migrate databases without losing referential integrity or do a lot of manual work. After the migration, we have to do very hard work to rewrite the apps. Finally, the result is far, far away from 100x. You will get the unstable application and many new difficulties. 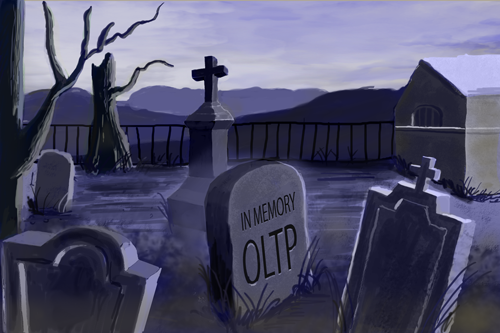 In Memory OLTP is a collection of technologies. You’re talking about the first item, Memory-optimized tables, which has all the drawbacks you mentioned. I was talking about the last item, memory-optimized table types. For me, migration would not be my issue. I would be able to use memory-optimized table types without the need for application downtime. Please let me know how checkpoint gets slower for imoltp.